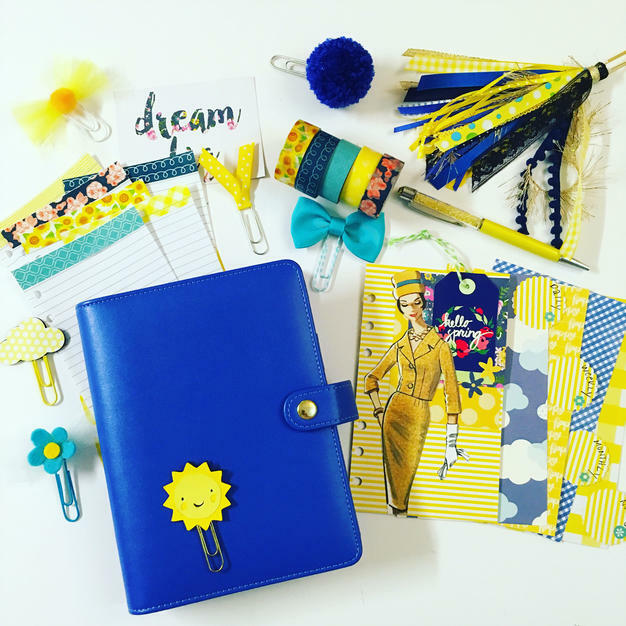 This week’s planner set up is all about Blue and Yellow! Earlier in the week I created a video showing how to use old dress patterns to decorate the dashboard of this planner. 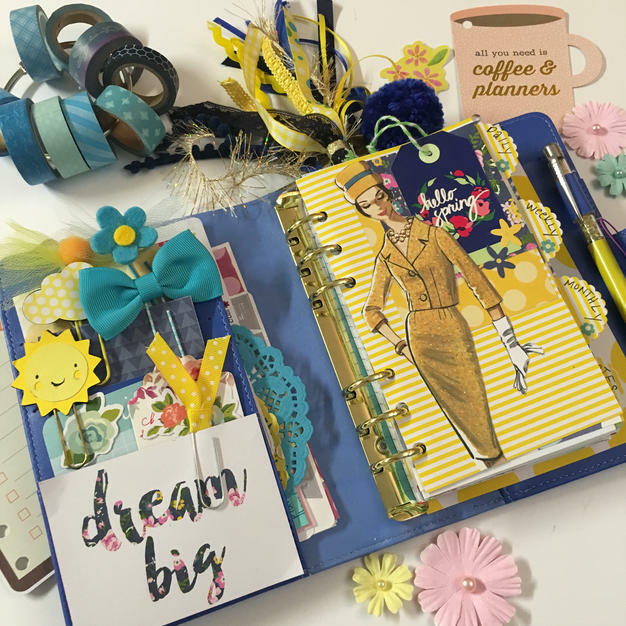 The blue planner is a Recollection planner from Michael’s Craft Store. I used Yellow and Blue Cardstock to create the coordinating dividers. The card stock was thick enough I did not need to laminate them. 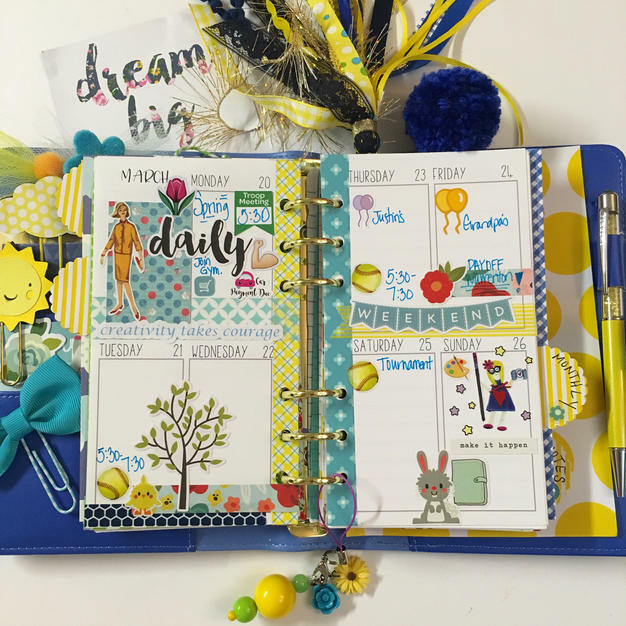 I used Blue and Yellow Washi to decorate weekly spread along with a variety stickers. Hello! 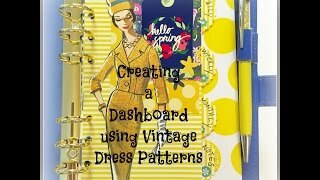 I created a quick video to show you how I create planner dashboards using Vintage Dress Patterns. I love the art and designs that cover vintage dress patterns and use them quite a bit in all my paper crafting projects. The ladies always look so stylish! I look for these dress patterns at thrift stores, garage sales or antique malls and can usually find them for about a dollar a piece. I make copies of the covers so I can have more than one use out of each of the patterns. In this video I show you how I make a dashboard using one of the prints. What I love about this style of papercrafting is the ideas or endless. You can use old book pages, photos, anything that you love the images. Hope you are inspired to create something today! Hello! 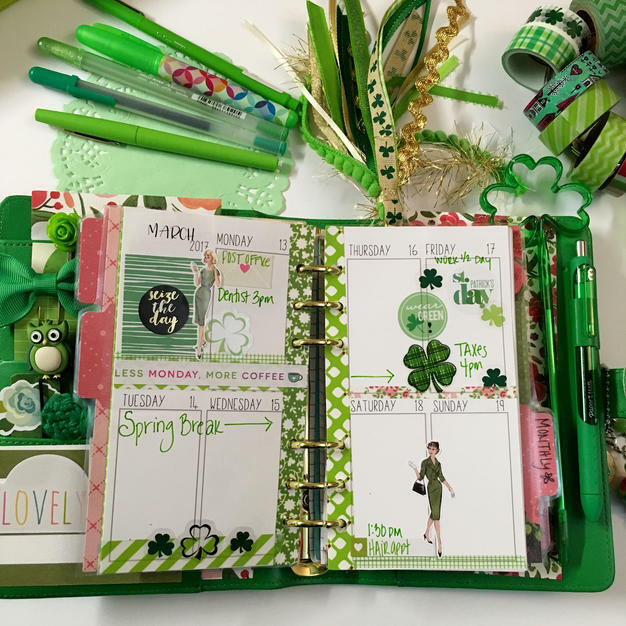 This week is all about green in my personal planner, even the planner itself thanks to the Michaels’ Recollection Planner. I have to say this green is a favorite! This week I used a vintage girl fussy cut from a dress pattern for the dashboard and dividers using bits and pieces from this month’s Bloom Kit. 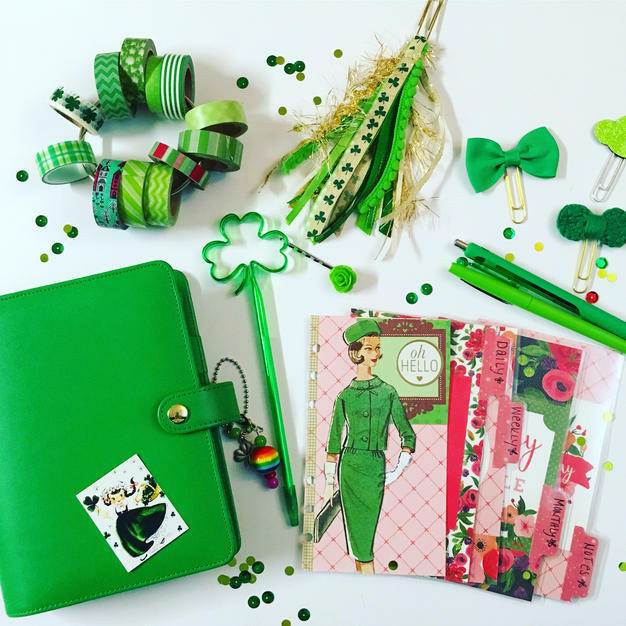 Of course since Friday is St. Patrick’s Day the tassel need to have clovers! On the weekly spread, I used stickers from The Happy Planner Stickers books and vintage honey girl stickers from The Reset Girl collection. Hello! Welcome to my blog!! 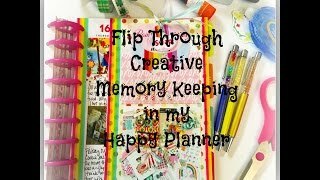 I wanted to share a quick video of a flip through of how I documented the months of January and February 2017 in my Happy Planner. I use pretty paper, washi, diecuts and ephemera to embellish the pages and tell my story! Thanks for watching !! Hello and Happy Monday!! I’ve missed creating videos during the month of February but , but I have several new fun and creative videos coming soon! 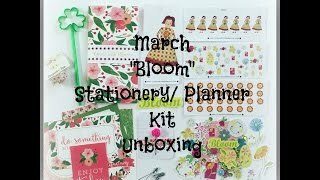 I wanted to create a quick video to show you what is in the March Stationery/Planner Kit! It’s all about BLOOM!!! Kit’s are available for purchase in my shop!! 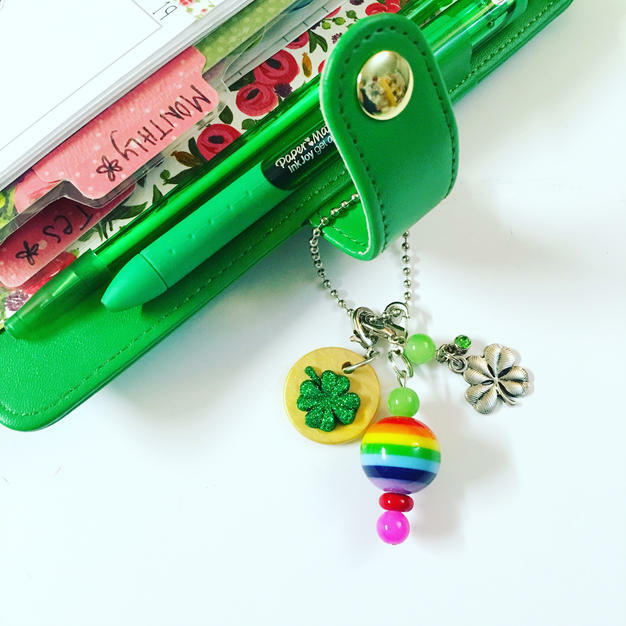 I know it’s already past mid-week and I haven’t posted about my planner set-up this week. I been working on the March Stationery/ Planner Kit which went on sale yesterday! This kit it a beauty full of vibrant colors and blooms. I’ll be posting an unboxing video soon. 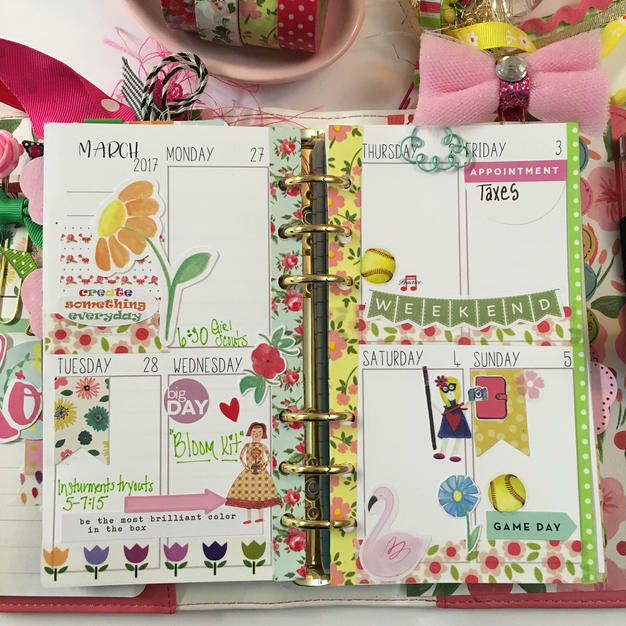 Today I want to show you my planner set up for the week, it’s all about pink. 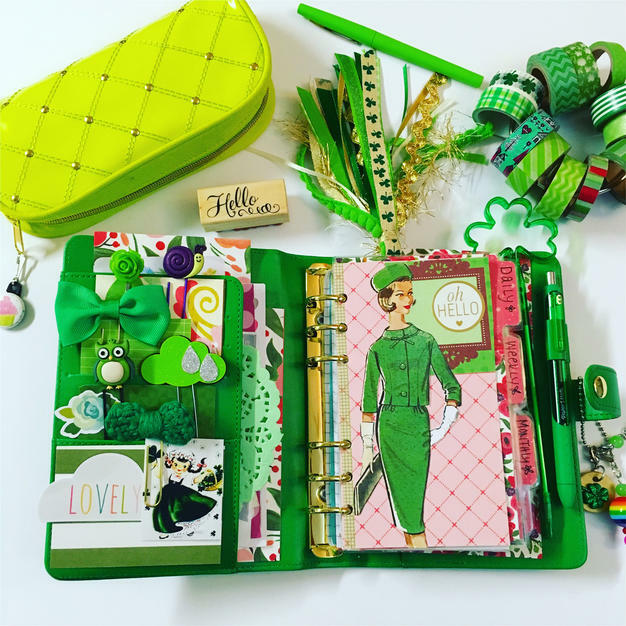 I’m using the Webster Pages pink personal planner and added another pink and green accessories to fill the pockets with flashes of delight! The dashboard used is a mixed media tag I created a while back using papers, paint and ribbons. I simply just clipped this to the front divider. Look at that mischievous smile on the little girl. She simply was cut from a vintage dress pattern. 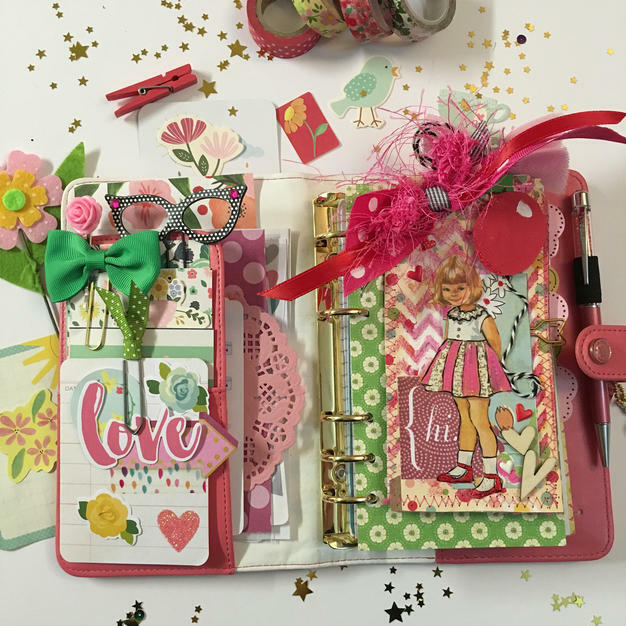 On the weekly pages I used lots of floral washi including the red flower washi that is in the March Bloom Kit. I also used several of the stickers and diecuts from the kit. Yay for organization! Hope your having a great week! Thanks for stopping in!